The Bygdoy Peninsula is situated on the west side of Oslo city and is a beautiful area, famous for its maritime history. 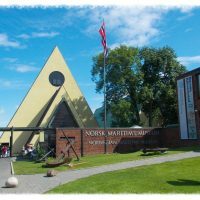 Arriving at the boat dock, you’ll find yourself surrounded by museums dedicated to Norway’s impressive history of exploration. Despite the fact that it’s quite a small area, you could easily spend oodles of time exploring all it has to offer. I don’t have any particular interest in boats. In fact, my overriding memory of sailing is contracting norovirus on a cruise ship. It’s fair to say I’m not the biggest fan of them and I wasn’t really sure what to expect from my visit. I was blown away by the standards of the museums, as well as the beauty of Bygdoy. This Museum hosts the world’s best-preserved examples of Viking ships in the world. It’s not a crowded space with tons of exhibits, so it provides great views without unnecessary clutter. There are other related artefacts on show, but the stars of the show are most definitely the ships. The Oseburg is on display as the world’s largest burial ship. Rather amazingly; it’s completely intact. There are many discoveries on show from the ship, as well as from other famous vessels, such as the Gokstad and Tune. There’s an excellent movie on a loop that’s worth catching if you can, as it gives you a great insight into the exhibits on show. A pleasant walk from the Vikings will take you to the Fram Museum. This details the history of the ship that saw three Polar expeditions and is the world’s most northerly and southerly travelling vehicle. You can actually go aboard the famous Fram and pretend you’re a hardy, seafaring Norwegian arriving at the South Pole. This didn’t work for me as the weather was glorious during my visit. Although I’ve never been to the South Pole, I’m led to believe it can be quite chilly. It’s hard to get into character when it’s 25 degrees outside. Anyway, I digress. The Fram was my favourite museum of the day and the standard of the entire building and its exhibits are world class. It’s interactive and easy to understand and, well….fascinating from start to finish. The best part of the museum is being able to board the Fram and see what life was like for her crew. Once you’re channelling the spirit of a fearless explorer, nip next door to the Kon Tiki Museum. Here you can learn about Thor (I mean, even his name sounds brave) Heyerdahl, who dared to steer the hand-built raft across the Pacific. The museum also houses the Ra II, which was, unlike its predecessor, was successful in sailing from North Africa to Barbados. Not an easy feat for a boat made of papyrus. I’m sure you’ll agree. The exhibits are dedicated to Thor’s intrepid explorations. They pay particular attention to his jaunts to Easter Island, where I hear he liked to go on holiday. I jest, of course — this man is a national hero and the information about his forays is fascinating. I’m just stunned anyone got *anywhere* on the rafts. They very much looked like something from that Tom Hanks movie where he made friends with a deflated football. The museum, maps and exhibits are testaments to a remarkable man and his talented crew. It’s little wonder that his home nation is quite so proud of him. If you still haven’t had enough boating excellent, head across the road to the Norwegian Maritime Museum. This space is dedicated to the shipping industry in Norway through the ages. It comprises six large spaces, which house the permanent collections. It also has space for visiting exhibitions and these are constantly changing throughout the year. The museum covers all manner of Norwegian maritime history and has a particularly excellent section on Norway’s WW1. There’s also a fascinating insight into what it was like to work in the industry, as a child, a seaman, and a female radio operator, amongst others. The cruel nature of Slavery and Pirating (is that a thing?) is also included. Although Bygdoy has a raft of boat museums (see what I did there? ), it’s also home to the Norwegian Folk Museum. This consists of an internal and an open-air space and details the history of Norwegian culture. There are permanent exhibitions on folk dress and art, knitting, the Sami culture, and the Reformation. The outside museum holds information on living in Norway and how the country and has changed over the years. This pays particular attention to the developments in Pharmacies and Dentistry. The Holocaust Museum shows a permanent and haunting exhibition on the treatment of Norwegian Jews during the Second World War. The building itself is famous for being the residence of Norway’s wartime traitor, Otto Quisling. The centre provides a memorial on the horrors of persecution, but it also aims to protect the identity and cultures of religious minorities. It’s a privately run establishment and contains a library and other educational materials. There’s a huge memorial wall in the main museum, which lists every name of the Norwegian Jews who lost their lives. It’s quite a shocking sight, for the sheer size of it, and just trying to comprehend the tally. It’s a beautifully put together and a pretty timely reminder of the horrors of persecution. Have you visited the must-see museums on Bygdoy?